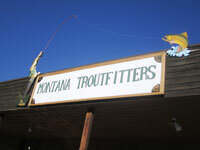 You show up at our store and we make sure you have a fishing license, then you will depart for our classroom upstairs in the store where we will go over some of the basics of gear selection - such as rods and reels, boots and waders, leaders and tippet etc. We will discuss the specifics of what lines and line weight rods are good for beginning anglers and what to avoid when starting out. Next we will demonstrate and practice different fishing knots and how and when to use these knots when setting up your fly rod and tying on flies. We will discuss with you the different techniques of fishing such as nymphing versus dry fly fishing versus streamer fishing and the basics of reading where fish hold. We follow this up with bug identification in the classroom with Jim Schollmeyer's Western Hatch Guide to accompany our collection of insects that we've amassed over the years (You'll repeat this process again on the river with real live ones!). We then will give you a short synopsis of fly selection (really we could teach a whole class on this if we wanted to). After absorbing all of this, we'll take you outside to do a little casting alongside the shop. After you've reached a sufficient level of casting prowess, we will treat you to a nice catered lunch before embarking on the fishing portion of the trip. The "Outdoor" portion of the class is split between kicking over a few rocks and examining the aquatic life, learning to read water where fish hold, practicing your casting and...FISHING! One of the best parts of the trip is that you have the full undivided attention of your guide to aid you in your casting, water reading, knot tying, bug identifying and general fishing growth. After finishing up on the water your guide will bring you back to the classroom where we give you a complimentary copy of The Curtis Creek Manifesto, which just happens to be the best beginners fly fishing instructional book ever. Think of it as a reference text you'll actually use after earning your degree!